Α. The Great Stairway that leads from the Agora to the Prytaneion of the city is located iat the heart of the urban cebter of the city-state of the Latoans. With a width of 8.40m the stairway consists of straight-line steps, nine in the west and ten in the eastern part, a difference due to the slope of the ground. The steps are clearly unequal with a width, varying from 0.30 to 0.60 m and height from 0.20 to 0.35 m. They are made of local limestone of varying size and are carved only on the two visible sides. 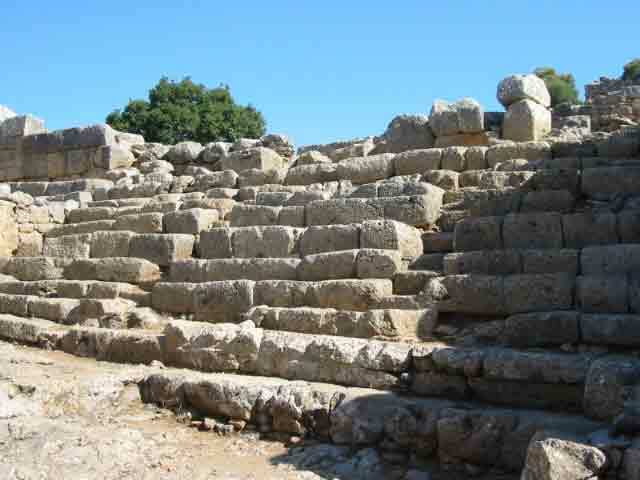 Two narrow stairs with lower steps, starting from the second row of the larger steps to the west and the third row to the east, divide the stairway into three sections, which resemble the seats of the cavea of the ancient theaters. The only difference is that here the steps are in straight lines. It is uncertain whether at the western part of the stairway there was originally a fourth tier. 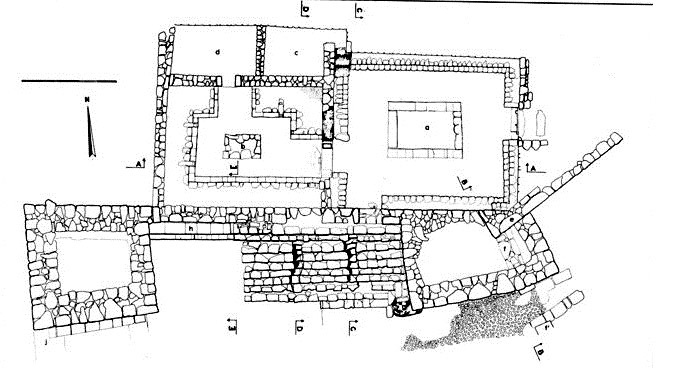 However, in 1899-1900, when the ancient city was first researched, at that location there was no tier but two chambers with entry from the open space of the Agora, as described by the first excavator Joseph Demargne, Director of the French Archaeological School, and as documented by a photo of that time. From its form it is clear that the Great Stairway was a place of gathering of the citizens. The capacity of its three tiers was estimated at 80 seated spectators, who could watch events in the center of the Agora, like religious ceremonies, political gatherings, etc. Β. The theater space is located on the slope of the south acropolis, in the immediate lower terrain from the city’s temple. This space consists of straight steps partly built and partly carved in the rock, a platform and the elongated almost rectangular open space in front of them. The platform is a 12m x 4.5m rectangular construction, built of rectangular local limestone blocks. At its western corner, the desk, as well as the walls at a height of 1.15m, are carved into the natural rock, while in the south corner, apart from the carved but lower walls, the natural rock is flattened at the floor level. The walls on the three sides of the platform appeared to have five rows of blocks and a desk at the base of the walls, while the fourth side to the north had only one row. On this side, it is not certain whether the desk continued or there were the building’s entrances. The platform, as it was shown during the excavation, was outdoors. The approx. 15m long built straight steps extend to west of the platform, reaching up to a rocky protuberance, but are saved in good condition only at the two ends. They are made of rectangular castors, 0.3m high and 0.6m wide. The lower steps are embeded on embankment while the upper ones are placed directly on the natural rock. There were initially 10 or 11 steps on the eastern side and another 7-8 steps on the western side. Of these, the only saved are at the base, the three built lower stairs and the rest which are carved on the rock at the highest section. Excavators have estimated that these steps could accommodate more than 350 spectators, counting at 0.40m the space an average man occupied. The free space is around 31m. long and 15.3m. wide at its maximum point and is occupying the northern part of the moat, which is supported by a tall retaining wall built with the polygonal agricultural system and has two tower-shaped semicircular structures at its ends. At its western end, at the height of the westernmost tower of the retaining wall, a three-step construction could have been the base of an altar or the base of a statue. The dating of the theater space is uncertain. According to the excavators, its construction should be placed immediately after the erection in the adjacent and higher moat of the city’s temple, which has been dated at the end of the 4th century or the first half of the 3rd century B.C. Two gathering areas have been discovered in Lato, the urban center of the city-state of the Latoans. Α.The Great Stairway that leads from the Agora to the Prytaneion of the city consists of straight steps that are divided into three wings by two narrow stairways with lower steps. These wings correspond to the tiers of the cavea of an ancient theater and the steps correspond to the seats. B. The theater space on the northern slope of the south acropolis, at the lower terrain from the city’s temple. This space consists of straight steps partly built and partly carved in the rock, a platform and the elongated, almost rectangular, free space in front of them. Joseph Demargne, Fouilles à Lato, en Crète 1899-1900, BCH 27, 1903, 206-232. Vily Apostolakou, Lato. Archaseological guide. Fund of Archaeological Resources, Athens 2003. The archaeological site in Lato is located within the municipality of Agios Nikolaos, 12 km from the town of Agios Nikolaos and 4 km from the nearest settlement, Kritsa. Α. Fairly good conservation status of the large stairway. B. Moderate conservation status of the theater space. As part of the wider retaining works conducted by 24th EPCA on the monuments of the site, ther have been some limited restoration in the area of Agora, the Stairway and the Prytaneion. In the area of the Agora, in front of the Great Stairway, one cultural event every year has been taking place since 2006.